Unfortunately online illustrations of the artist’s work are disappointing in size and variety and the artist’s own site is constructed around unhelpful Flash presentations that prevent any more precise linkage, so the usual accompanying links in the text here are often less than ideal. Where only titles are cited, the reader is urged to open a second window on the artist’s site and find the relevant works. This article also appears on CAP'S CRITS where it has the advantage of opening links in separate windows (making it easier to follow the text rather than toggling between text and illustration). 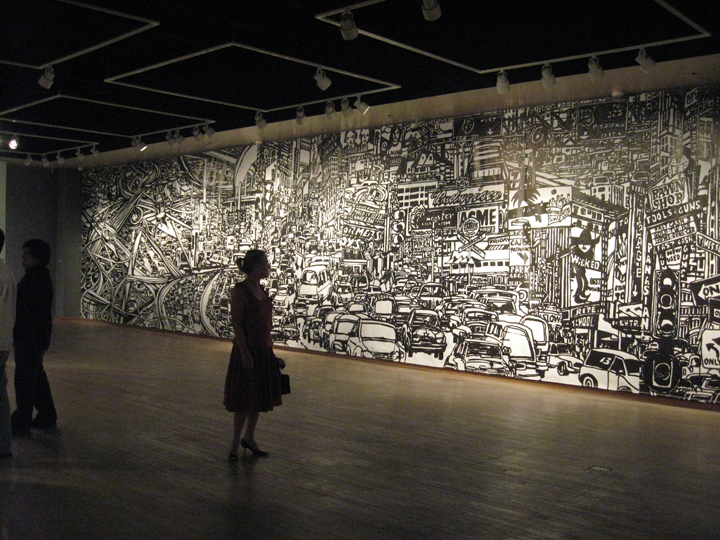 A retrospective spread across several venues at Dade College, Miami (Feb – May 2013) covers sixty years in the career of the artist, now in his ninetieth year (b.1923). While the location may seem remote it is a measure of the respect in which Mesches is held that the doyen of west coast art criticism, Peter Selz and distinguished New York curator and critic, Robert Storr contribute to the catalogue. Mesches gained greater recognition with his first New York show in 1984 (at the age of sixty), as painting made the transition from Neo-Expressionism to broader revival and eclecticism. 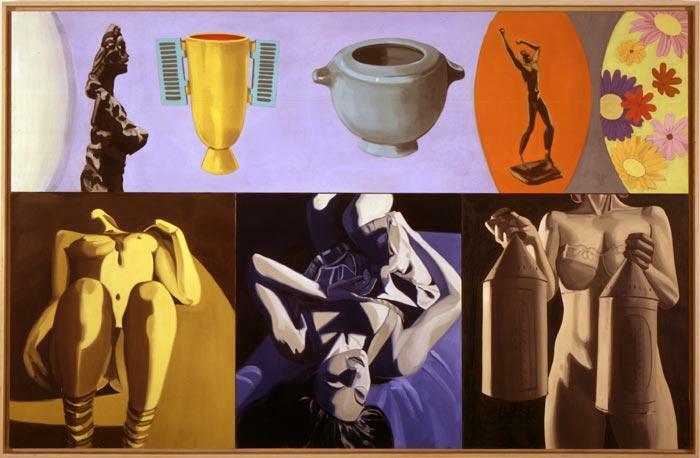 His juxtaposed imagery or montage, art historical allusion, political themes and expressive brushwork fell perfectly in step with Post Modern trends, but rather than pursue an arch stylistic and iconographic virtuosity – the main drift to the times - Mesches’ work turned to more oblique symbolism, a more integrated pictorial space. Subsequent work remains interesting for the issues that then arise for facture and signature, greater stylization or abstraction, but these are a road less travelled in contemporary painting. This review does not argue with the artist’s standing but rather considers the perspective afforded such byways on mainstream currents, the suggestions found there for more promising projects. It is remarkable of course for an artist to finally gain public acceptance at sixty, but it is even more remarkable for an artist to only then find their mature style. For Mesches did not arrive at his successful style many years before, only to have the good fortune of eventually being discovered in 1984. Although the New York Times reviewer for his breakthrough show, Grace Glueck, treated it as ‘a case of a trend catching up with an artist’, actually the reverse is closer to the truth. Mesches long and circuitous development only really gathers momentum after spending most of the seventies working through a series of portraits, pacing Photorealism (a trend of the time), to eventually grant himself freer modelling. It is only around 1981 that his work abruptly switches to more compartmentalised composition, Expressionist handling and recovers some of the political themes of his youth, as in Postures 1 (1981) and Postures 2 (1982). The work then assumes much of the character associated with his mature style. What prompts this change is not so much an attention to fashion as the artist’s social circle. The artist’s second wife, the writer Jill Ciment, attended the California Institute of the Arts between 1972 and 1975 where she became very influenced by the teachings of John Baldessari. Baldessari’s background in Pop Art and later ideas about pictorial layout and photomontage inevitably filter through to Mesches, whose activism throughout the sixties had to some extent obscured contemporary developments from him. He had been an organiser of the famous Peace Tower or Tower of Protest against the Vietnam War on Sunset Boulevard in 1966 for example, but found the demands of activist graphics eroding his focus on painting. In 1968 he abandoned painting to concentrate on writing. It is only with Ciment’s studies in 1972, that he recommenced. Baldessari’s influence at the time also extends to his student David Salle, understandably, so that later comparisons with Mesches’ juxtapositions are well founded, the two in fact acquainted. As well, Baldessari later became a subject for one of Mesches’ seventies portraits, cementing (or Cimenting) the association. But while the influence of Baldessari accounts in part for some structural features in Mesches’ work at this time, it is the artist’s many years as a commercial artist and his roots in activism that provide unexpected drive. Mesches art progresses slowly from a Social Realism in 1945 to Siqueiros-influenced portrayals of dignified labour, such as The Meat-cutters, (1954) to more allegorical treatments of market forces and class struggle, such as Masquerade No.5 (1960). But political art is often compromised - is commonly seen as the art of compromise - serving neither cause well where the message of politics must be reconciled with the sophistication of means in art. Mesches gravitates toward more symbolic themes, only to find them somewhat inert and literary. Throughout the sixties, he looks to more stylised and graphic imagery only to find these all but forsaking painting. For the committed activist and painter, this is a profound dilemma. However, once Mesches adopts juxtaposed images, firstly in the triptychs mentioned, then, in larger more ambitious works, contrasting parts generate a satisfying interplay or dialectic; allow a freer, more personal facture. 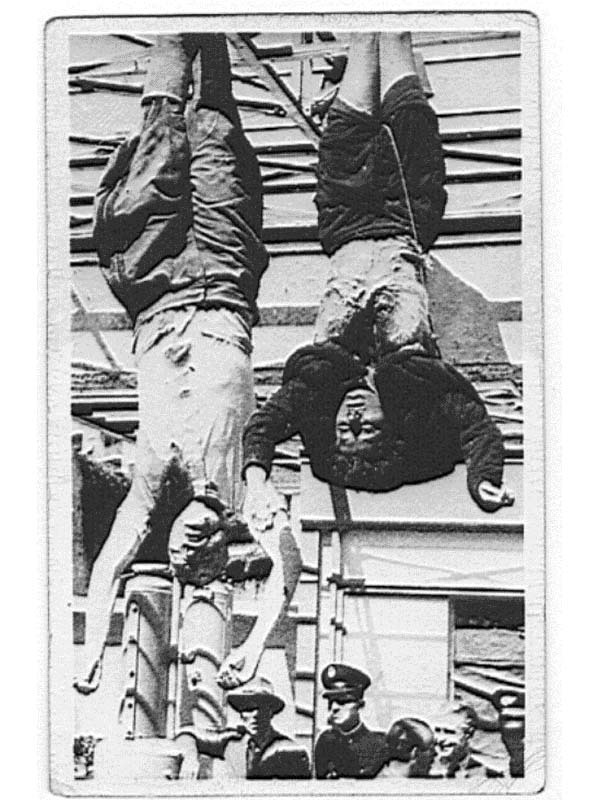 In Art in Public Places 1 (1983) the artist uses a background based upon Delacroix’s Liberty Leading the People contrasted with foreground figures drawn from a photograph of the public execution of Benito Mussolini and his mistress Clara Petacci in 1945. Even where the source for the latter is not recognised, the suspended corpses register as victims of a world upended, of a futile gesture. The contrast is also between a hyperbolic triumph (the Storming of the Bastille) and a more recent and historical account of mob justice. It is not simply fact set against legend, but one informing and inflecting the other. We have as much of Delacroix as the execution allows, as much of the execution as Delacroix needs. Yet the work would be no more than deft iconography, a cartoonist’s cunning equation, were its meaning confined to this juxtaposition of sources. Crucially, the two-way trade extends to treatment, so that the broad brushstrokes are at once a crass and dismissive rendition of Delacroix yet a lush and lyrical rendering of a press photograph. Here activism ascends to art or art stoops to activism and the middle ground is intriguing yet troubling. The contrast between photographic and painterly source effectively dissolves under the artist’s storming brushwork but survives as contrasting colour codes, reminds us of the precarious balance. On screen the work might seem easel-scale, but actually it measures 203 X 244cm. Thus the bold brushwork attains enormous vigour, surprising for acrylics, and gives the work a ruthlessness and spontaneity usually associated with a much younger artist. But for Mesches it gauges the confidence born of experience. At a time when diffidence, deliberation and detachment hold sway, in work by Salle, Longo or Bleckner, for example, Mesches’ fluency and conviction is compelling and promptly recognised. It must have been an astonishing moment for the artist, indeed, an interview in Brooklyn Rail attests as much. Yet roughing up traditional works in order to nurture afterthoughts is to rely upon the most literal and flatfooted of options. As noted, Mesches is not tempted further down this Post Modern path and soon jettisons the obvious reworking of a noted masterpiece for more contemporary iconography. 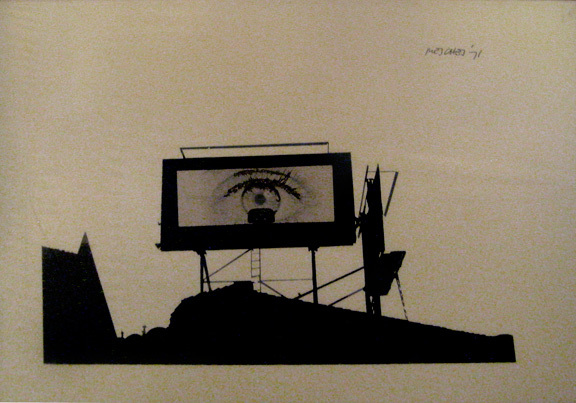 A work such as Suburbia 1 (1985) introduces a stricter more abstract tableau. Four yellow deckchairs are arranged in approximate symmetry around a snarling dog and against a black backdrop. Above, a young female trapeze artist launches toward the viewer, arms outstretched invitingly. This figure apart, the metaphoric meaning, implicit in the title, rhymes recreation against hostility, repose against vigilance yet poses them in a curious void. The background does not so much suggest night as a blank or abstracted space. This detachment gives the work a more schematic feel, akin to a Salle or Longo, and notably the opportunity for looser handling is somewhat curtailed in the interests of less familiar illustration. The artist does not quite find the same bravado to facture outside of safe tradition. The work is thinner, starker than Art in Public Places 1. The trapeze artist would seem to have little to do with a theme of suburbia, its retreat and anxiety, but such tableaux are increasingly associated with amusing spectacle, a shallow pretence or facade in the artist’s work. ‘Suburbia’ thus becomes another precarious feat by the trapeze artist, but its use here and the depth implied perhaps overload the composition. The following series contrast chandeliers with bus boys, valets and ladies’ dress dummies but retain dark, slightly more nuanced grounds that no more than hint at interiors. The uniforms and costumes to figures stress roles and a certain compliance or constraint. The chandeliers stand for an entrenched establishment, its luxury and power, as much metonym as metaphor. Here too we have spectacle, a dazzling ornament that illuminates little of its circumstance, looms large over its occupants. The contrast is essentially between opulence on high, obedience on the ground, brilliance measured in decor versus industry measured in staff. Figures are employed, literally and metaphorically, to further conspicuous ownership and propriety. The mood is predictably gloomy; the sources of light leave a lot in darkness. In The Three Chandeliers (1987) a valet carries two dead game birds as he strides toward the viewer with a resigned expression. The source for this iconography is uncertain. The lowered chandeliers around him echo the pendulous birds in each hand; enhance an ominous, oppressive mood. There is an implicit chain of command. The strange, angular treatment to the birds, perhaps recalls much earlier work. In other works the illumination assumes a distinctly sexual heat. Mesches now deals in tradition beyond obvious art history, with an establishment, literally top-down, or as light source. Significantly the chandeliers are rendered in looser more vigorous strokes. This not only sharpens the contrast with the figure but demonstrates a crucial attitude. As with Art in Public Places 1, the artist is intent upon a certain fluency or confidence in execution. The chandeliers register as not just an impression or shorthand observation, but as shorthand of a photograph of chandeliers, their overexposure and tone dropout. There is no surrounding halo or flair to them, so they remain curiously ineffective in illuminating surroundings. 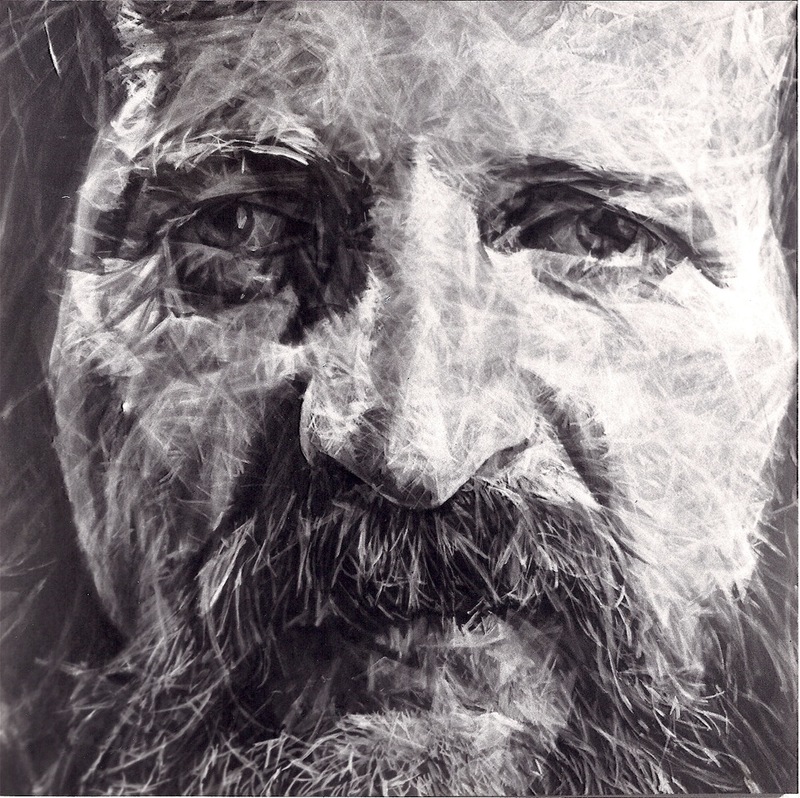 In this sense there is an indifference to source or object as well as technique. Traditional facture here stylises or abstracts the chandelier in a way that stresses a summary or casual assembly, a concern with gestalt or whole. The focus is upon ‘the big picture’ and the artist is prepared to sacrifice some detail in ways quite distinct from observation of light or source imagery, in prompting a more symbolic and expressive function. The contrast with the figure is then with a tighter, less confident treatment, with doubt or concern. Here attention is upon the person rather than grand design. This accords with our intuitions of course, but helps us to see how meaning exceeds iconography or content, involves considerable technique. These distinctions in fluency and facture however prove difficult to sustain, rely heavily on composition and content. If Mesches’ later work meets with less enthusiasm it is because subsequent content drives them to finer, less discernible or effective contrasts. But these are still worth considering, if only to conceive of more promising avenues. 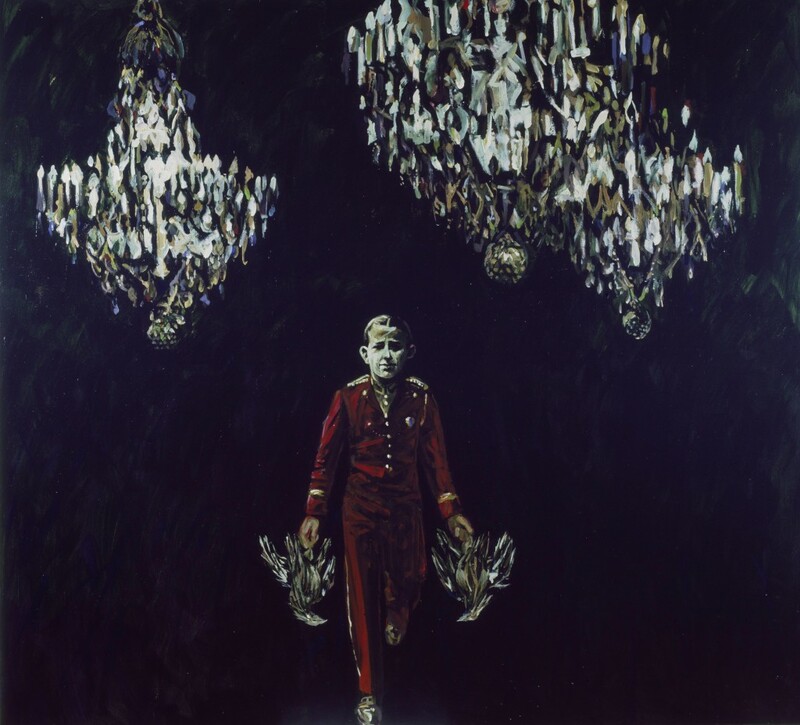 The chandelier works build symbolic contrasts within a unified or continuous picture space where earlier work had relied on a greater disjuncture between foreground and background. In Negative Spaces (1990) the artist turns to more rigid and unusual tableau. While the picture divides easily into foreground and middle-ground, this is not really a decisive structural feature. The vast assembly of figurines, including small versions of Michelangelo’s David, Venus de Milo, Myron’s The Discus Thrower, Nefertiti, Tutankhamen, busts of a Red Indian Chief, various lawn jockeys, animals, 18th century portraits and plastic dolls may conceivably constitute some actual display, at a flea market perhaps. But since nothing in the surroundings supports this context, the rationale for the collection becomes a more general display of constant and indiscriminate production and acquisition. It is the levelling and crowding of tastes, the mixing of messages that emerges as salient. Again, the casual brushwork runs figures and tones together; adds to the debased, bleached-out quality; urges consideration as an ensemble and symbol. Mesches thus still brushes up against art history, if not quite painting, but now points to a disturbing crowding of sources. Negative Spaces denotes this loss of ground. The work is also part of a series called Anomie that continues throughout much of the nineties and concerns a loss of morality, although could as easily be loss of culture. The three toy sailing ships to the foreground with their Spanish insignia feebly allude to Christopher Columbus, so that the imposing ensemble before them stands for the spectre of America that follows. Conversely, the toys offer a trivialised account of America’s origins, apiece with the onset of kitsch. Either way, allegory pointedly creaks here through cheap merchandise. Other works in the Anomie series address moments in American history on more montage-like terms. Sometimes they employ similar figurines but where photographic sources dominate or content becomes more intricate, a freer treatment is compromised and loses some of its expressive charge. At such points the work needs a fuller, more abstract or gestural component but here Mesches becomes hostage to his big picture, succumbs to too much illustration. It is understandable given his background and temperament, to some extent. He was never going to be a more programmatic or formalist painter, but his ambition at a certain point requires this. Painting at a certain point requires this. And it is not that the artist is incapable or indifferent to greater license in facture, there are examples of heads and torsos that demonstrate he can go there on occasion, unfortunately not on the big occasion. The dancing gestalt beckons, but as noted, depends upon ruthless and express skipping of detail. Mesches cannot always oblige there. But again, this may be something others can revisit with profit. Some works in the series highlight toys and ornament without contrast to high art. 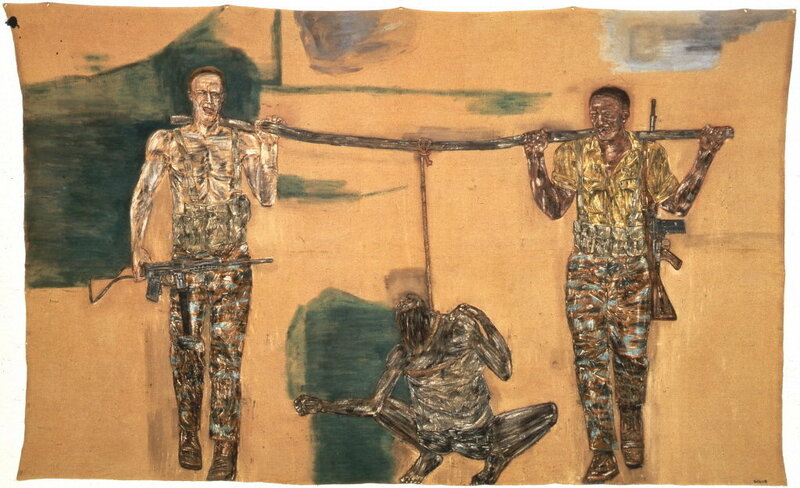 Works such as The Training Bout (1993) and Lead Soldiers (1996) maintain a continuous picture plane or perspective but introduce curious contrasts in scale that also prompt metaphoric readings, darker agendas. Here too, simpler compositions make more room for summary facture and the works duly acquire a more peremptory sweep, a sardonic mood. The interest in war reworked as game or toys, in diversion and public amusement ultimately derives from Juvenal’s rationale of ‘bread and circuses’ and in later work Mesches is explicit in declaring this of pictures. But the point is also urged in a number of the Anomie series where images of fairground rides are combined with military presences, consumer luxuries and classical sculpture. In Winged Victory (1991), Black Hawk helicopters jostle with a Spook-arama model of Cyclops, a splendidly dashed-off Victory of Samothrace, and sundry historical figures; as if Desert Storm had been inspired by Coney Island and the Great Depression. History is collapsed into myth, politics into spectacle and the present reviews proceedings as farce. These are common New Left sentiments but are unlikely to have increased the artist’s popularity. Nevertheless the artist has found voice for longstanding convictions that prove worthy formal challenges. In a following series the work spells out the personal cost of this commitment while adopting more modestly scaled and familiar collage. The FBI Files series commence in 1999, when the artist was able to access his own FBI files under the Freedom of Information Act to discover the 760-page dossier covering the years 1946 – 72, had been severely censored and contained some suspicious omissions. These gaps occur over the period of a burglary at his studio on the 6th of August 1956 when over two hundred works were stolen, including a series on the notorious spies for the day, the Rosenbergs. Many of these actual file pages featuring stark deletions were then photocopied by Mesches and used in the collages. It is worth quickly outlining a little more of the artist’s history in order to establish just how much of a threat he posed to America. Mesches was raised in Buffalo and moved to Los Angeles around 1943 at the age of twenty-two to take up a scholarship in commercial art at the Arts Center School. By 1946 he realised commercial art was not fulfilling enough and his scholarship was promptly withdrawn. Anxious for an income he commenced work as a set painter on a Tarzan movie only for the production to be halted by a general strike over wages. The strike lasted a year but eventually was broken by the state and the unions demonised. Hollywood’s abrupt swing to the right anticipated the communist witch hunts of McCarthyism and career-crippling blacklisting throughout the studios. 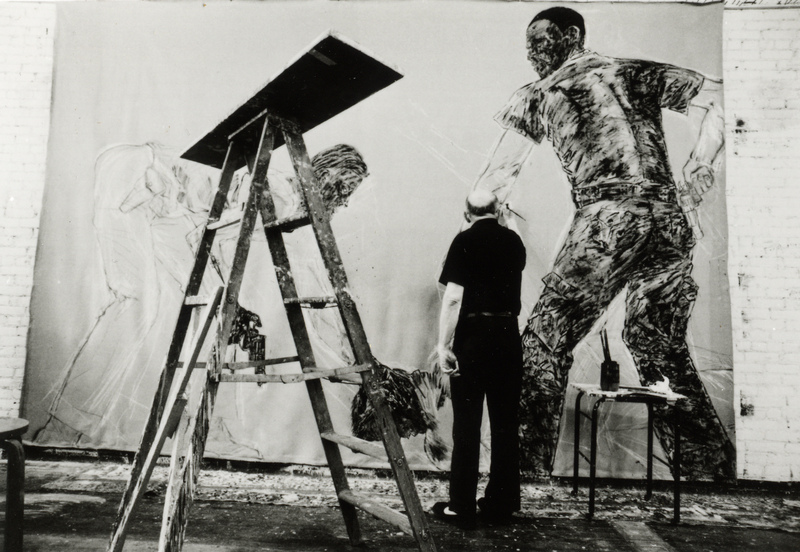 It is unclear how much more work the artist gained as a set painter. He subsequently worked in Mexico with its noted public muralists before returning to Los Angeles and drifting into private teaching through contacts that included Edward G. Robinson and Ronald Reagan, while remaining active in local social causes, occasional work as a graphic artist. In the sixties he worked for CBS as a courtroom artist. This, incidentally, led to a cameo appearance in Escape from The Planet of The Apes (as a courtroom artist) in 1971, to add a further twist. His activism in other words, remained confined to peaceful public demonstrations, networks of sympathetic organisations and fund raising. His FBI files document nothing more than the mindless bureaucracy of a closet police state. But they are a sharp reminder that America’s version of democracy is heavily weighted toward rightwing privilege and capitalist exploitation. It is hardly surprising that notions of public spectacle and entertainment should take on a pointed political cast in his work. The FBI Files series build on direct contrasts between picture and text, mainly between painting and document, expressive protest and its prosaic administrative extension. Yet the line is rarely clear cut. 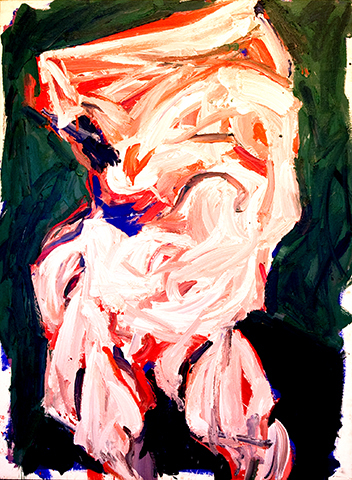 In FBI Files 2 (2002) the large expressive head of an unknown man in animated conversation shares its vermillion colour key with the background for the abutting file sheet with its conspicuously torn edges adding another expression for urgency or violence. Moreover the bold black deletions and emphasis to the text echo the expressive tenor of the painting; become an equally gestural rebuttal. Text is thus drawn into expressive modes, just as painting duly reflects content of text. In fact there is no way of knowing from inspection whether the loose frame drawn around item three to the document is the work of the FBI or the artist. Some deletions obscure information but the curiously hesitant frame highlights a list of associates. 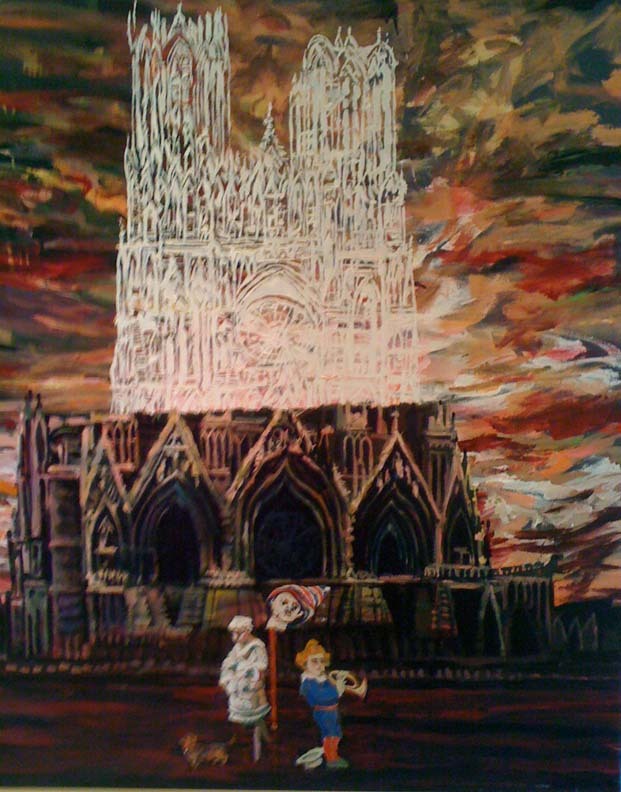 This compartmentalising maintains the essential montage aesthetic, as does the border filled with a range of small inset photographs of figurines, toys, mannequins and a fairground ride – much the same range used in the Anomie series – but here on a flat orange background they are somewhat reminiscent of similar arrays in the work of Salle from around this time. Mesches thus extends his expressive range over photomontage and text. Significantly, many works also employ crude stencilled borders that draw folk ornament into the meaning, in just the way that chandeliers and classical figurines have been enlisted in adducing grander, more oppressive powers. But here, folk decoration is equated with a DIY and outsider status, announces the paintings and their contents as victims rather than victors. This attention to the wider or bigger picture is consistent with the artist’s signature fluency and dispersal of themes. The series understandably stresses the linear and graphic, but the impulse to flow across elements, to prune and paste, finds an ironic parallel in the deletions and emphasis visited upon his FBI files. The works establish an uncanny counterpoint. This more linear approach is given impressive scope in a following body of work from around 2005, called Coming Attractions. While this includes a range of simpler paintings, the centrepiece is Coming Attractions 2 (2007), a series of brush and ink drawings scanned and printed onto vinyl and enlarged to a scale of 366 X 2164cm (for an animation of the complete panorama, see the artist’s website under Selected Works >Coming Attractions 2 >view all). Here Mesches’ broad relaxed line runs together buildings, advertising, streets and traffic in abrupt shifts in scale and perspective to arrive in parts at an abstraction where outline surrenders legibility to sheer pattern or shape. The shifts are disarmingly simple, elegant and satisfying. The massive work thus attains exactly the kind of sweep that has often eluded his more historic and programmatic works. Amazingly, this departure is the work of an artist in his eighties. Possibly he needed the compression of style to merely heavy line and tone to forego nagging detail, to see content in broader strokes and broader strokes as content. Then again it may have been the transfer of intimate sketches to an imposing mural scale that inspires a more panoramic and spontaneous vision. The style also permits caricature, something his work has hitherto resisted. But individual parts are less compelling that the sprawling, blaring whole to such work. Coming Attractions 2 sheds historical allusion for the contemporary city as symbol of relentless, shrill and incoherent spectacle, as a maze of marketing and mobility, coercion and corruption. But it is the intriguing crossover between abstraction and ragged illustration that may yet reward other investigation, a younger generation. At a time when painting oscillates between photo-based genres and mannerist exaggeration, a retreat to stricter, linear means and less concrete composition may prove instructive. Subsequent work by Mesches perhaps inevitably comes as an anticlimax. The compressed and chaotic spaces are not carried through in many of the later paintings to the series. Occasionally the outline is used almost to suggest a ghost to the rest of the picture, but generally the artist is content roam more widely, allow style to condense scenes, amplify pretence and stereotype, revisit art historical allusion. The Shock and Awe series from 2012 comes closest to sustaining the momentum with its night scenes of burning cars and buildings. There is no telling whether they are the result of riots, an industrial accident or even airstrike. In the largest work, perspectives or pictures are again stacked or squeezed together in a way that allows the fire to flow smoothly across them spreading the spectacle. Here something of the structure to Coming Attractions 2 persists, but might have been more emphatic, literally taken further to the edges of the painting as a continuous wall. While fires are a staple of news reports and hold a constant fascination, to press for some deeper, ideological meaning, the paintings need this structural prominence to flag something more than the literal content. Smaller works hold even less of this. While the vigorous treatment of flames and the engulfment of cars may ably express the artist’s flowing drive and pessimism, the concomitant social or political target eludes them. At this stage of the artist’s career of course, such rigour may hardly be a priority. 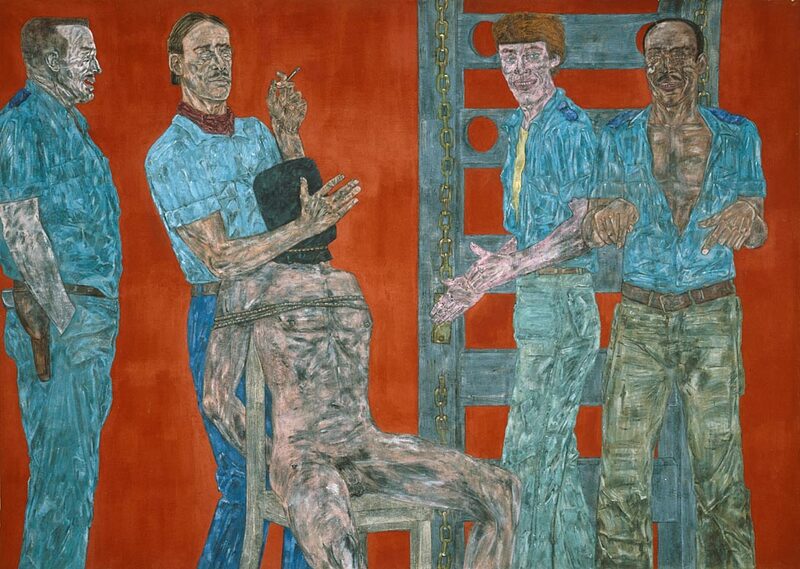 Given his long involvement with political themes, however, it is appropriate to conclude with a comparison with a contemporary political painter, Leon Golub (1922-2004). While both are drawn to political subjects and reject prevailing styles and accepted sentiment, develop a distinctive touch and attitude and find recognition late in their careers, in other ways their work is antithetical. In temperament, taste and theme, the contrast is illuminating and helps to summarise Mesches achievements. Mesches became acquainted with Golub through mutual friends following his breakthrough show in 1984. Golub helped him obtain teaching at New York University, Parsons College and Rutgers University. This allowed Mesches to base himself in New York and sustain interest in his work there. Like Mesches, Golub became disillusioned with his work at one point (1975 in Golub’s case) and virtually abandoned painting, only to recover his confidence in 1976. Both artists struggled outside the mainstream. Like Mesches, Golub held left wing views but his work remains more informed by art world issues and art history, less influenced by activism. Golub’s work focuses on the figure and proceeds not from Socialist Realism but an elemental Expressionism, steeped in novel materials for facture and mythic identities, a common strand to painting in the fifties. By the late sixties he switches to subjects drawn from the Vietnam War. The work maintains a grand scale, although significantly, the canvases are un-stretched, quite apart from matters of practicality, their informal looseness is vital in contrasting with traditional grandeur. By 1976 the work refines his distinctive attenuated drawing to figures and facture using a variety of blades to scrape back paint in small, patient gestures, giving the work an abraded or distressed quality. Subject matter also shifts to scenes of mercenaries and torture. Figures are much larger than life-size, but rather than grant them a mock heroic sweep or confidence, the drawing actually stresses a delicacy or brittleness in outline, a clumsiness or naivety to pose and proportion, a decidedly flattened or detached approach to modelling. The effect, despite the scale, is strikingly un-monumental, chillingly precise yet stilted. The figures become scarcely credible projections, huge teetering visions of almost inhuman cruelty and degradation. Little in the way of background or setting is supplied. All is invested in pose and interaction of figures. The intensely worked surfaces heighten the sense of scruple and scrutiny, or a gruelling ordeal to resist humanising the figures and yet detail appearance. Apart from literal distress, Golub’s touch often peppers figures with white highlights irrespective of modelling, giving them a flickering, spectral presence. The effect is a curious denial of competence, a wilful obfuscation that alerts us to a terrible conflict in picturing such people. The contrast with Mesches is firstly with dedication to the figure and dogged facture versus greater context and more expansive gesture. Golub starts from scratch and scrubs his way toward realisation in cautious increments. Mesches recycles depleted sources with panache, employs a restless, roving touch that no more than confirms suspicions for an accommodating whole. One is bottom up the other top down. Golub wants to eyeball perpetrators, for the threat to be explicit. Mesches prefers more discreet (and discrete) arrangements, for the threat to be implicit. One is blunt and confrontational, the other suave and evasive. One personifies the other fetishises. Golub flattens the picture into a stark declaration of bodily intimidation; Mesches layers the picture into a network of metaphors that stretch from social history to ornament. Yet both point to a troubling nexus between morality and politics. Undeniably, Golub’s work is the more powerful and effective. His single-mindedness is eventually rewarded with a hard-won style that trumps New York painting in particular, yet remains elusive to category and only grows in stature. But while Golub achieves greater impact, Mesches holds a subtler, more insidious message. For Mesches there is no retreat to reassuring primitives, to an Expressionism assured of pure expression. His pictures can at best recycle and revise, rearrange and reconsider. The ship is not to be rebuilt much once at sea. Feeling must struggle with familiarity, a formidable technique and fugitive theme. His work is not content with the morality of politics or vice versa, but admits their irresistible slide into aesthetics and commerce. The work lacks the punch of Golub but compensates with greater reach. Mesches can find no simple or obvious villains but his roving, sceptical eye can join the dots, read between the lines of a city filled with spectacle, the fireworks for those blinded by enlightenment bereft of profit, the toys of those to be toyed with. The work is by necessity diffuse, its impact equally so, but its roots and its routes run deep. The artist is unlikely to receive greater recognition but perhaps Mesches’ work awaits more discerning measures.